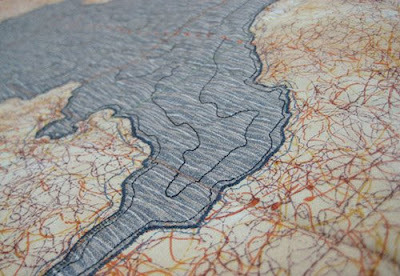 Wisconsin-based Leah Evans fabricates her own landscapes in a very non-traditional way: through the combination of maps, satellite imagery, aerial photography, and fabric. I am embarrassed, really, because I have always wanted to attempt this idea myself but never had - and now I feel I could not do it justice! 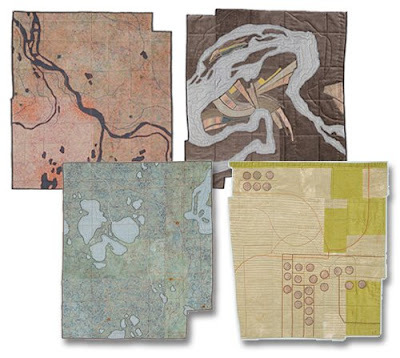 "It is the use of maps in organizing our ideas of land that interests me most of all... Most of my pieces are not consciously based on specific places. 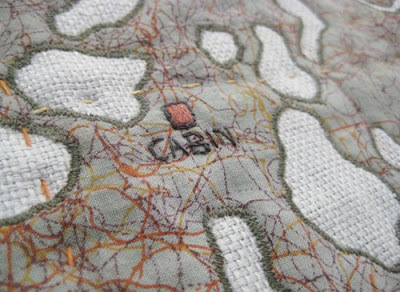 For me they are intimate explorations of map language and imagined landscapes. Through my research and experience I have decided that maps create more questions than they answer."